We confirmed some amazing news today using a Clearblue Digital Pregnancy Test with Conception Indicator. There is just something about a digital test that makes you more at ease. 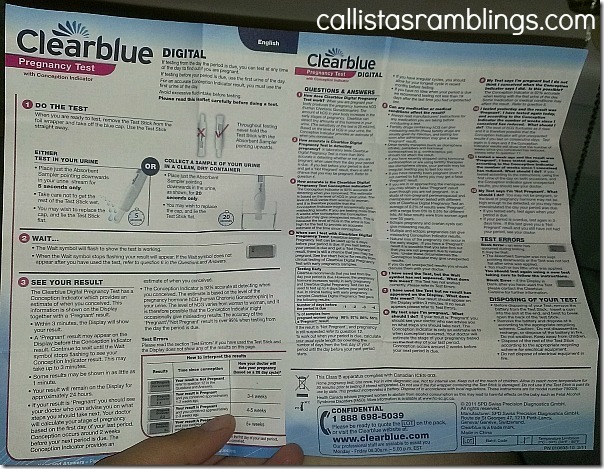 The Clearblue Digital Pregnancy test requires a few more steps than your usual pee sticks but it’s not hard and the tests come with extensive instructions that cover everything you need to know as well as answers to frequently asked questions. The photo above probably makes it seem really complicated but it’s not. The main thing to remember is after you open the test out of the foil package, do not hold it with the absorbent part pointing upwards. You have two options, you can hold it in your urine stream or collect some urine and hold it in the test cup. I recommend the second option because you have to make sure not to get the rest of the test stick wet and it needs to be in the stream for 5 seconds only. I don’t know about you but it’s hard to figure out just where the stream will go. When I have to give a urine sample to a doctor, I have to move the cup around until I get the right spot! With the second option, you can hold the absorbent pad in the urine just right for 20 seconds. Within 3 minutes (for me it was around two) you should see the test say pregnant or not pregnant. The conception indicator takes a few extra seconds although my test finished before the 3 minute mark. Isn’t it nice not to look at the box or instructions again to see if two lines means pregnant or a line and plus or whatever depending on the brand? Pregnant or Not Pregnant, doesn’t get much more straightforward than that! The conception indicator takes a bit more understanding but the chart in the instructions and on the box is very helpful. If you don’t already know, doctor’s date your pregnancy based on the start of your last menstrual period even though you don’t conceive till an average of 2 weeks after that. So I conceived 2 weeks ago but I am 4 weeks pregnant. How Accurate Is the Test? How Early Can I Test? The conception indicator is 92% accurate. The accuracy of the Pregnant/Not Pregnant results is over 99% accurate when testing from the day your period is due. 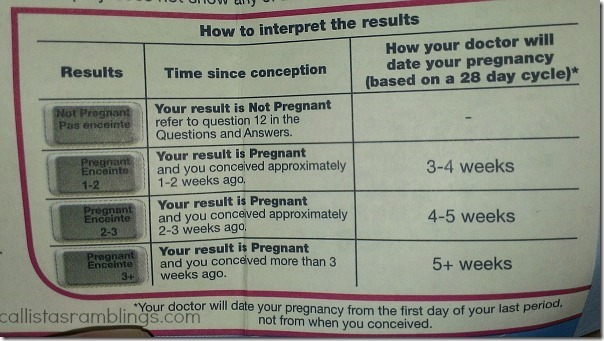 You can test up to 4 days before your period is due but the % of an accurate reading goes down a percentage. It’s possible to get a Not Pregnant result a few days before your period is due and still be pregnant. It would be because your HCG levels are not high enough to be read by the test. Normally when you are done, you toss your pregnancy test in the garbage right? There is one step you need to take with this test first and that is take out the battery. Just use a coin to pop open the end and pull out the battery. Dispose of the battery however you are supposed to in your community and you can put the rest of the test in the garbage. Not Ready for a Pregnancy Test Yet? If you are trying to conceive and would like a bit more help, Clearblue also makes digital ovulation tests that show a happy face if you are ovulating or an empty circle if you aren’t. You can get pregnancy tests through Amazon or any pharmacy. They also make a fertility monitor if you are looking for more.